Posted in Senza categoria on maggio 29, 2014 by calciocorea. DPRK Premier League, Sports contest for Pochonbo Torch Prize. Posted in Senza categoria on maggio 28, 2014 by calciocorea. Pyongyang, May 27 (KCNA) — The AFC (Asian Football Confederation) “C” license award coaching course took place in the Democratic People’s Republic of Korea. The course focused on the practical problems arising in football teaching and training guidance, and it was attended by coaches of the sports teams and instructors from juvenile sports schools and football classes in the city of Pyongyang. In this regard, KCNA had an interview with Kim Yong Gil, a lecturer of AFC, and Kim Jin Guk, a coach of the April 25 Sports Team. Journalist: Would you tell about the recent course? Kim Yong Gil: The course was given, divided into theoretical and practical sections, under a teaching plan worked out in accordance with an outline from AFC and the country’s specific conditions. The theoretical section dealt with the scientific and theoretical problems coaches and instructors should refer to in their teaching and training guidance. And the practical section made the participants get a deep understanding of what they learned in theoretical lecture, seeing performances of players from sports teams or schools. Journalist: What’s your impression of the course? 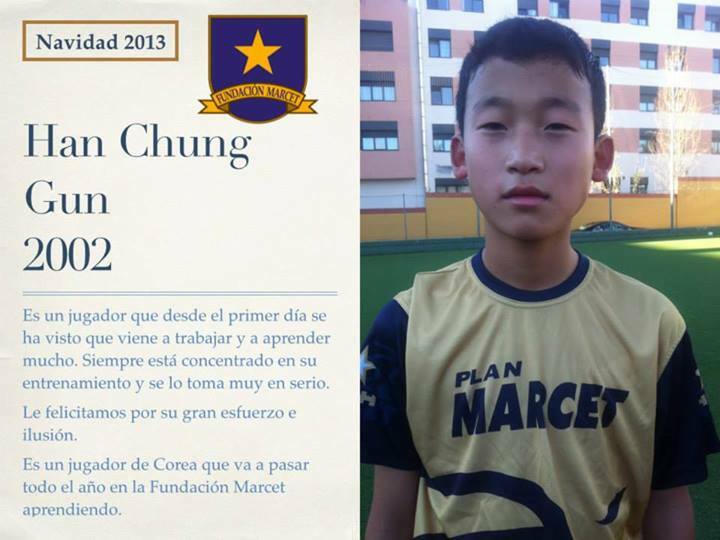 Kim Jin Guk: The course was of great help in improving the qualities of football coaches and instructors. I learnt a lot of things, such as the three important factors in the basic technical education and the principles to be abided by in attack and defence. Pyongyang, May 14 (KCNA) — Men’s soccer games of the second round of the premier league of the Mangyongdae Prize Sports Games ended. Finals between the April 25 Team and Amnokgang Team took place at the Kim Il Sung Stadium on Wednesday. The April 25 Team defeated its rival 1:0. Before the finals a match was held between the Kigwancha Team and the Sobaeksu Team. The Kigwancha Team defeated its rival 1:0. In the second round games the April 25 Team took the first place and the Amnokgang and Kigwancha teams the second and third places. The April 25 Team took the first place and Amnokgang and Sobaeksu teams second and third places in the total standings of the men’s soccer games of the premier league of the Mangyongdae Prize Sports Games. Posted in Senza categoria on maggio 26, 2014 by calciocorea. Pyongyang, May 23 (KCNA) — The Olympic Committee of the DPRK, as a member state of the Asian Olympic Council guided by the idea of peace, unity and friendship, decided to dispatch DPRK players’ group to the 17th Asian Games slated to take place in Inchon, south Korea, from September 19 to October 4. The DPRK Olympic Committee officially informed the Asian Olympic Council of the decision and will soon make necessary applications according to the rules set by the Council and the organizing committee of the Games. Posted in Senza categoria on maggio 23, 2014 by calciocorea. Posted in Senza categoria on maggio 22, 2014 by calciocorea. Posted in Senza categoria on maggio 21, 2014 by calciocorea. Posted in Senza categoria on maggio 16, 2014 by calciocorea. The Cup Final in North Korea is unlike those elsewhere. Half the stadium’s seats are assigned to civilians – who in summer all wear white hats, white shirts and red ties – while the other half is allocated to the military. Match marshals control the crowd with flags, instructing them to chant or applaud with wooden mitten clappers. Players play clean, without histrionics, high fives or faked injuries. After every goal the crowd claps in unison and – if the Supreme Leader is present – the whole of the scoring team rushes forward to stand before him and salute. In league matches live music is played by a military band. No advertisements encircle the pitch. There are no queues, hotdog stands or programme sellers. The press corps number no more than three cameramen who idle behind the goal’s net. For the first time in many of their lives, the young players were permitted to travel abroad. In South Africa, they faced Brazil and then Portugal, two of the world’s top teams in the so-called ‘group of death’. Their head coach Kim Jong-hun told the media that the Dear Leader himself gave “regular tactical advice during matches” via “mobile phones that are not visible to the naked eye”. Nevertheless the team lost both matches. “We were welcomed home with great warmth,” enthused Ri Myong-guk, countering the accusation that the coach had been publicly humiliated by government officials on their return. Since then, Ri Myong-guk has played over 60 games with the national team. At Pyongyang’s Kim Il-sung Stadium, in the shadow of the vast and heavy Arch of Triumph, the national team prepared for its upcoming friendly against Kuwait. Dressed in red kit, they rushed forward in attack, fell back in defence, practised headers and corner kicks. The manager barked instructions, then called the team together to deliver tactics and technique. Around the edge of the AstroTurf circled other managers and minders, filing reports on mobile phones and taking notes. Ri Myong-guk’s favourite European club is Manchester United, whose former player Edwin van der Sar is among his favourite goalkeepers, along with Real Madrid’s Iker Casillas. The attacker he fears most is Cristiano Ronaldo. Foreign football matches are often rebroadcast in North Korea weeks or months after the event. 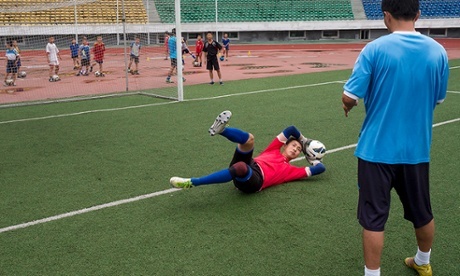 At the edge of the field, Pyongyang’s junior teams were training for their local matches. One of the youngsters paused to catch his breath and watch his hero Ri Myong-guk save half a dozen shots on goal. 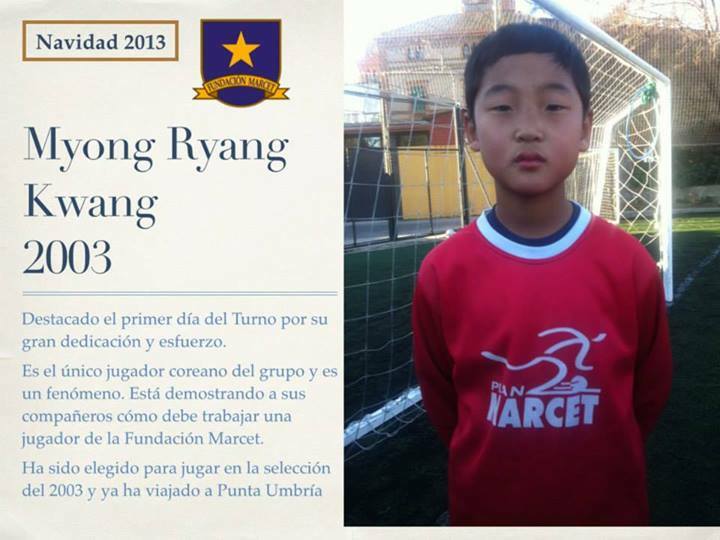 “When I grow up I want to be goalkeeper like Ri Myong-guk,” said the wide-eyed nine-year-old. “I must practise hard so as to make my contribution to the Korean people’s struggle toward victorious nationhood,” he added. Posted in Senza categoria on maggio 15, 2014 by calciocorea.